You know how we're an art family...: Cars! Ever since Finn was old enough to notice cars driving down the street, he has been completely fascinated with all moving vehicles. Cars was his first word in regular use; discovering his brothers' discarded Hot Wheels cars was tantamount to Christmas (which is saying ALOT considering that's also his birthday); going out to see the cars from the driveway is standard operating procedure for calming Finn down during distressing times; and turning Finn's carseat around was a momentous occasion simply for the amazing view of passing cars it afforded. Finn loves cars. 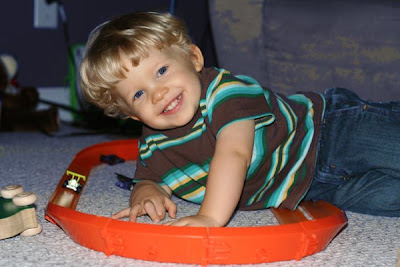 His love of cars was recently catapulted into full-blown obsession by two new activities, the addition of a simple racetrack to the toy collection, and learning the words "Ready, Set, Go" accompanied by flinging the cars across the kitchen floor, hopefully in a rolling fashion. I'm eager to see how long the car obsession grips Finn, whether it's a passing toddler joy or whether indefinite subscriptions to Motor Trend, greasy fingerprints on the wall, and random motor parts littering the garage are in our future. Either way, it's CARS for now.